0:51 – Jason introduces Caterina Fake and gives an overview of her journey over the past 15 years. 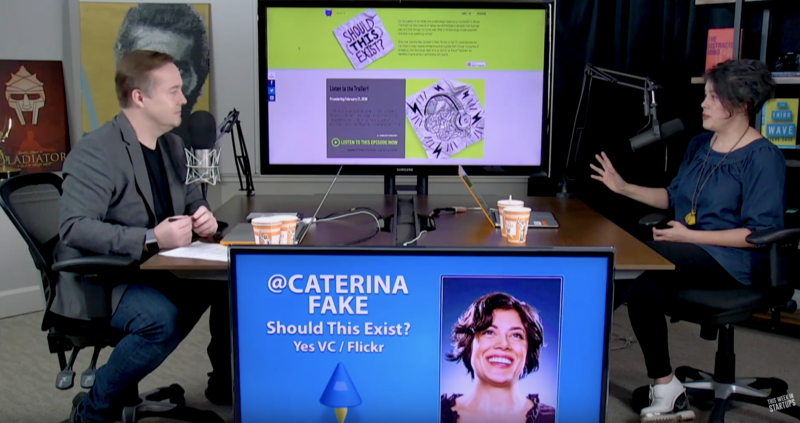 2:37 – Caterina explains why she invested in two non-obvious startups like Etsy and Blue Bottle Coffee, and getting involved with Kickstarter. 11:31 – Jason thanks sponsor Kruze Consulting. Visit kruzeconsulting.com/twist to receive a free tax consultation and tax credit white paper. 13:26 – The new podcast “Should This Exist?”, and why Silicon Valley is in the crosshairs. 21:24 – Sharing stories about meeting Mark Zuckerberg, and creating online communities. 27:23 – Jason thanks sponsor DigitalOcean. Sign up at do.co/twist to receive a free $100 credit. 29:25 – Thoughts on Instagram and how it has changed social interactions, advertisements and the world at large. 37:05 – Jason and Caterina play “Should They Exist?” – robotics soldiers, CRISPR manipulated babies. 45:40 – Jason thanks sponsor HubSpot. Visit hubspot.com/startups/twist to get benefits and learn how to grow your startups! 47:25 – Reminiscing about Yahoo, Zima, CD-ROM, and the Internet in its early days. 54:04 – Thoughts on automation jobs going away, and previous job experiences. 1:00:28 – Anti-billionaire rhetoric, and what went wrong with Twitter. 1:10:15 – Thoughts on the Zebra movement, and the Samwer brothers.